In October 2008, amidst claims that one of its subsidiaries was knowingly hiring illegal immigrants, North Carolina poultry producer House of Raeford Farms initiated a systematic conversion of its workforce. Following a U.S. Immigration and Customs Enforcement raid that nabbed 300 undocumented workers at a Columbia Farms processing plant in Columbia, S.C., a spooked House of Raeford quietly began replacing immigrants with native-born labor at all of its plants. Less than a year later, House of Raeford’s flagship production line in Raeford, N.C., had been transformed, going from more than 80 percent Latino to 70 percent African-American, according to a report by the Charlotte Observer. Under President George W. Bush, showy workplace raids like the one that befell Raeford were standard—if widely despised—fare. And though the Obama administration has committed itself to dialing down the practice, Homeland Security Secretary Janet Napolitano has occasionally found herself the bearer of bad news to immigration activists who expected the raids to end entirely under her watch. Spriggs has a difficult road ahead. In this recessed United States, competition for all work is dog-eat-dog. But that holds especially true for low-skilled jobs, jobs for which high school dropouts (like Spriggs) and reformed criminals (also like Spriggs) must now vie against nearly 12 million illegal immigrants, 80 percent of whom are from Latin America. What's more, it seems that, in many cases, the immigrants are winning. From 2007 to 2008, though Latino immigrants reported significant job losses, black unemployment, the worst in the nation, remained 3.5 points higher. 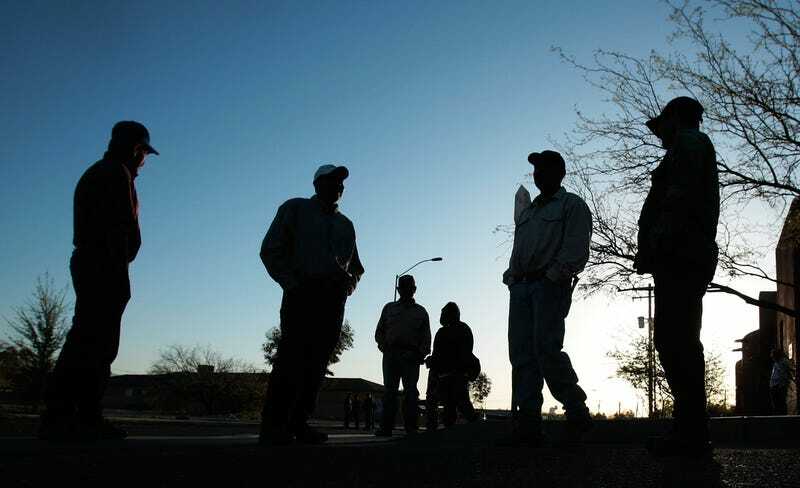 Despite President Fox’s assertion, of the Pew Hispanic Center’s top six occupational sectors for undocumented immigrants (farming, maintenance, construction, food service, production and material moving), all six employed hundreds of thousands of blacks in 2008. That year, almost 15 percent of meat-processing workers were black, as were more than 18 percent of janitors. And although blacks on the whole aren’t involved in agriculture at anywhere near the rates of illegal immigrants—a quarter of whom work in farming—about 14 percent of fruit and vegetable sorters are African-American. For their efforts, African Americans were paid a median household income of $32,000 in 2007. In the same year, the median household income for illegal immigrants was $37,000. Besides competing for work while simultaneously attempting to avoid drastically deflated paychecks and benefits, unemployed African- American job seekers must also frequently combat racial discrimination. In a 2006 research paper called “Discrimination in Low-Wage Labor Markets,” a team of Princeton sociologists discovered that, all else being equal, black applicants to low-wage jobs were 10 percent less likely than Latinos to receive positive responses from potential employers. Furthermore, employers were twice as likely to prefer white applicants to equally qualified blacks. "To be blunt, a lot of employers would rather not deal with black American workers if they have the option of hiring a docile Hispanic immigrant instead,” says Mark Krikorian, executive director of the Center for Immigration Studies. Krikorian’s organization advocates a large-scale contraction of immigration to America, one of the main reasons being that low-skilled immigrants aren’t contributing to the U.S. labor force in a way that American citizens can’t. Nevertheless, Krikorian says that easily exploitable immigrants remain attractive to businesses looking to eliminate hassles. “[Illegal immigrants] are not going to demand better wages, and they're not going to ask for time off,” he adds. “And frankly, a lot of bosses are thinking, 'I don't want to deal with a young black male.'" Most political analysts expect the debate over immigration reform to find new life in 2010, under a president who thoughtfully supports both increased border enforcement and the “recognition of immigrants’ humanity.” Wherever the discussion meanders, however—from amnesty on the left to expulsion on the right—from here on, it seems that anyone interested in speaking thoroughly on the matter can no longer do so without discussing its impact on black America. Cord Jefferson is a regular contributor to The Root.